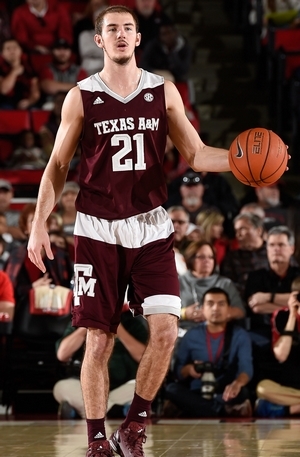 It was a tale of two careers at Texas A&M for senior guard Alex Caruso. While Caruso displayed impressive court vision and passing skills as a freshman and sophomore, his team finished under .500 in the SEC in both years. In his junior season, the team benefitted greatly from incoming transfers Jalen Jones and Danuel House who helped revitalize the program. In Caruso’s senior year, the team brought in their most talented recruiting class ever, as well as transfer point guard Anthony Collins, which forced Caruso to shift from a ball-dominant role to a more valuable fit as a part-time facilitator and off-ball shooter. As Caruso’s role shifted, the team’s fortunes did as well – culminating in a Sweet 16 appearance in 2016. Caruso’s numbers don’t pop off of the page, averaging just 8.3 points, 5.0 assists and 3.6 rebounds per game in his senior season. Still, he was undeniably an integral cog in the SEC’s second most efficient offense. Almost a non-shooter as a freshman, shooting 26% for 3 and 60% from the free throw line, Caruso eventually developed into a respectable marksman, hitting 38% of his 3-pointers and 79% of his free throws as a senior. At 6-5, Caruso has excellent size for a point guard. He settled into more of combo guard role as his career at A&M has progressed (with his usage dropping to a career low 15.6% as a senior) but he’s undoubtedly a point guard who is at his best when creating for others. He’s an excellent passer, with his 7.0 assists per 40 minutes pace adjusted ranking sixth among DX top-100 prospects. He has the height to see over the top of the defense, and the fundamentals required to make every type of pass a point guard needs to make. The ball never sticks in Caruso’s hands. His off-ball movements are phenomenal and he reads the plays on the court in frames ahead of his teammates. He has potential to be a strong facilitator out of the pick-and-roll, where he’s corrected his shot enough to be a respectable threat as a shooter. While Caruso can be somewhat passive at times offensively, letting the game come to him to a fault, he’s a little more turnover prone than you might hope considering his projected role. His handle is a little sloppy, and he can get careless with the ball at times. He loves to attempt jump passes, which put him in losing predicaments when he presumes cuts that fail to materialize. He turned the ball over on 25% of his possessions this season, which has been par for the course of him his entire career, and is the highest rate among any player in our Top-100 prospect rankings. Playing off-ball to accommodate Billy Kennedy’s roster, Caruso continued to evolve as a shooter in his senior year. He hit 37.7% (20-of-53) of his catch-and-shoot attempts this season per Synergy Sports Technology. He’s a reluctant shooter, especially as the game winds down, and is far worse off the dribble than he is with his feet set. He positions his elbow in tightly on his release, which is both slow and in front of his face – making it easily contestable for defenders. Regardless, Caruso’s development as a free throw and 3-point shooter as a senior offers promise to his continued shooting development elsewhere. With the ball in his hands, Caruso is a somewhat reluctant driver, but is capable of attacking closeouts and will probe the defense when the situation calls for it. His first step is unremarkable, but he is a little more athletic than you’d think, and he has a nice shiftiness to his movements. He would benefit from increased upper body strength as he occasionally struggles to finish through contact, though his 57.4% efficiency (35-61) on field goals around the basket is solid. The efficiency around the rim is even more impressive, considering he uses his right hand practically exclusively on finishes. He’s a crafty finisher, so he gets away with it at the college level. If he wants to succeed as a pro, however, he’ll need to add dexterity to his game. Caruso’s a diligent rebounder, as evidenced by his 5.0 boards per 40 minutes pace adjusted. His box outs are fantastic for a player of his size, often clearing space for his teammates to grab the board, even if it doesn’t show up in the box score. On the other end of the floor, Caruso is a tenacious defender and is always communicating with his teammates. He has instances when he gambles too often, but his 2.7 steals per 40 minutes pace adjusted rank third behind just Kris Dunn and Gary Payton II in our database for NCAA prospects. His lateral quickness improved as a senior and he’s slightly stronger, which helps compensate when he’s overmatched athletically. He has supremely quick hands that help him intercept passes for easy transition baskets. His instincts on the defensive end are great but he gets distracted on occasion when defending off-ball. His closeout technique on shooters is innate and even when he doesn’t get credit for a steal, he’s seemingly always in the thick of things when it comes to turnovers. He gobbles loose balls at an eye-popping rate and forces jump balls regularly. Overall, Caruso has the size and skill-set to succeed as a backup or third string point guard at the next level. He needs to cut down on his turnovers and continue to improve his shooting to carve out a niche as a big, steady, reliable backup in the pros. Still, he’s a player almost any coach would love to have and he has an impressive knack for making winning plays. While he may not hear his name called on draft night, Caruso is easily the kind of player who could find his way onto a NBA roster and stick for a few years if he’s able to catch the right breaks.